Reclaim the College and contain the Eye. 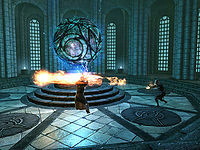 Position of Arch-Mage in the College of Winterhold, Archmage's Robes, key to the Arch-Mage's Quarters. Breach the barrier around the college with the Staff of Magnus. Confront Ancano in the Hall of the Elements. Defeat Ancano with the help of the Staff of Magnus. When arriving back at the College, you will see that all is not well. Tolfdir and the other college mages have been awaiting your return. A magical force field created by the Eye of Magnus now surrounds the college and Tolfdir will tell you of Mirabelle's death. Looking to Tolfdir for direction, he will say, "You're the one with the staff, my dear/boy. If it can help us get inside the College, and reach Ancano, we'll have to hope there's a way to stop all this." That is your cue to equip the staff of Magnus and lead the charge into the College. Tolfdir tries to stop Ancano from activating the Eye of Magnus. Aim the staff at the barrier and it will dissipate, allowing safe passage into the College. 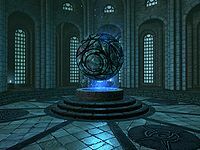 The quest now is to get to the Hall of the Elements where Ancano is trying to activate the Eye of Magnus. Ancano will proclaim that he has the power to destroy the world at his fingertips, and that he cannot be stopped. He has become connected to the Eye at this point and absorbs more and more power from it. Tolfdir will cast a fire spell at Ancano, but to no avail. Tolfdir tells you to use the staff on the Eye. It will begin to crack open, then emit a blinding flash, and you will be briefly stunned. Both Tolfdir and your follower (if you have any) will be paralyzed and remain this way until Ancano is dead. When the Eye is fully open, it will spawn magic anomalies and Ancano will lose his connection with it. The Eye will emit a blinding light; after this happens, continue to use the staff on it until it fully closes again. Ancano is vulnerable at this time and he should be busy dealing with the magic anomalies. Start inflicting damage. If you take too long, Ancano may reopen the eye and become invulnerable again; in this case, simply repeat the procedure and he will eventually succumb. Tolfdir will assist in eliminating the anomalies. It is not recommended that the staff be used for battle, as it can quickly run out of charge. Fortunately, you can recharge it with the soul gems dropped by the magic anomalies, though the staff requires almost two grand soul gems' worth to fully recharge. When Ancano is defeated, ask Tolfdir what you should do now. While he explains that he does not know how to contain the Eye, Quaranir, of the Psijic Order will appear. Quaranir will congratulate you, telling you that you have met their expectations. He will assure you that the Psijic Order will safeguard the Eye, which might otherwise destroy the College along with the rest of the world. He will observe that the world is not ready for the Eye, as Ancano just demonstrated, and declare you the new Arch-Mage of the college. Two additional members of the Psijic Order will appear, surround the Eye, and then vanish in a glow of light, taking the Eye with them. Tolfdir will then affirm that you should be the new Arch-Mage, and give you the key to the Arch-Mage's Quarters and the Archmage's Robes. This battle is an opportunity to farm soul gems. Magic anomalies will spawn whenever Ancano reopens the Eye after you've closed it with the staff, which can be soul-trapped in addition to the filled soul gems they drop when killed. Staying close to Ancano may encourage him to open the Eye sooner than if he is allowed to keep some distance while vulnerable. It may be advantageous to keep the Staff of Magnus for the quest Aftershock; however, it is not required. Note: This workaround may resolve some of the following bugs: Exit the college and fast travel to another city. Tolfdir should follow you there and you should get a quest update stating that you have defeated Ancano. Fast travel back to the college and speak with Tolfdir to complete the quest. If he doesn't arrive with you, simply wait (up to a day or two) for him to return. You may get to the Hall of Elements only to have Tolfdir run in and bypass the cutscene, making the staff useless. If this happens, you cannot harm Ancano in any way. This may be a scripting error caused by obtaining 2 staves from the quest before. Tolfdir may also fail to follow you into the Hall of Elements, which prevents the completion of the cutscene and the start of the fight. If this happens go through one of the side doors near the entrance, then come back in. Should that fail to help, fast travel elsewhere and return to Winterhold. You may have to use the staff to gain access to the college again. It is also possible that closing and reopening the gate in the hall helps, triggering Ancano's taunt and starting the sequence. ? To prevent Tolfdir from running into the hall and engaging Ancano prematurely, enter the hall. Make sure to save your game, ideally at the barrier before using the Staff to dissipate it. Stop at the door, move forward just enough to open the inner door and trigger Ancanos dialogue. Do NOT enter the hall, move back and stay at the doorway(to skyrim). Tolfdir should move up, say his dialogue, and trigger the fight with Ancano normally. You will know it is working if Tolfdir and any follower you have with you-are paralyzed by Ancano. At this point-move forward, use the Staff on the Eye and kill Ancano. The key is NOT to move forward with Tolfdir, but remain at the doorway, this should, hopefully, resolve the invincible Ancano problem without resort to elaborate workarounds. You can get rid of the additional staff by typing player.removeitem 00035369 1 in the console. To stop Tolfdir from running in and starting the fight prematurely, use TDetect which will stop either Ancano or Tolfdir from attacking each other, allowing the script to progress normally. TDetect can be turned back on again once the Eye of Magnus opens. You may also enter to find a member of the Psijic Order already present in the hall, skipping over the cutscene between Ancano and Tolfdir, preventing Tolfdir from finishing his cutscene. This makes the quest impossible to finish. You must reload a previous save before entering the college to continue. ? You may defeat Ancano and then speak to Tolfdir. After Tofldir's scripted speech, Quaranir might not appear in the scene. ? To fix this, use player.placeatme 0002ba3c in the console to make Quaranir appear. This will cause the rest of the quest to proceed as normal. Tolfdir may run into a corner of the entryway to the hall and will not attack Ancano. Entering the Arcanaeum and waiting for a few hours before reentering the Hall may fix this. ? It is possible for you to kill Ancano without having to use the staff to make him vulnerable. It requires you to sprint ahead of Tolfdir and wait until a half second after the speeches end. At this point Ancano is vulnerable, although very briefly, and can be killed with a high-damage or critical attack. ? It is possible for Arniel to enter after killing Ancano and reanimate him to fight any remaining Magical Anomalies, causing him to stand up and immediately begin fighting you again, including the fight dialogue. Ancano may remain invulnerable after you close the Eye. If you have the Eye closed and cannot hurt him, you may need to reload an earlier save. While trying equip the staff of Magnus you may get the message "You cannot equip this item". This means you cannot enter the College and the quest becomes unfinishable. To fix this, use player.equipitem 00035369 1 in the console to force-equip the staff from your inventory. If the above command fails, use player.additem 00035369 1 in the console to add a new staff - one that you can equip. After defeating Ancano and receiving the objective Talk to Tolfdir, Tolfdir may no longer be in the Hall of Elements. He can usually be found walking along the road on the other side of the mountains South of Winterhold, but will not have the dialogue option required to complete the objective, making the quest unfinishable. Reloading a previous save from before entering the Hall of Elements for the final battle may resolve this problem. ? 200 Finishes quest Ancano has been defeated. 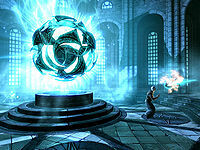 The Psijic Monks have removed the Eye of Magnus from the College, saying that the world is not ready for such a thing. With the crisis over, I have been named the new Arch-Mage of the College. On the PC, it is possible to use the console to advance through the quest by entering setstage MG08 stage, where stage is the number of the stage you wish to complete. It is not possible to un-complete (i.e. go back) quest stages, but it is possible to clear all stages of the quest using resetquest MG08.